Those are the words that our players first read on a wall of The Emirates on a matchday. 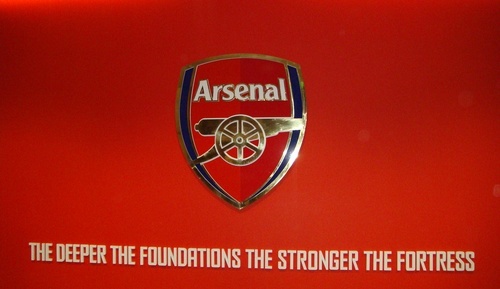 It’s also a phrase that, in my opinion, describes Arsenal Football Club’s current state of affairs perfectly. There’s one thing I’ve learned about football recently; it’s that the game is all about perspective. Different people look at things in very different ways, and I’ve had to take back a few words, especially about players from other teams. I thought David De Gea and David Luiz were both not good enough, but they’ve proved me wrong this season, and I took back what I said. (Luiz is far from the best defender in the league, but he’s not as bad as some neutrals make him out to be). 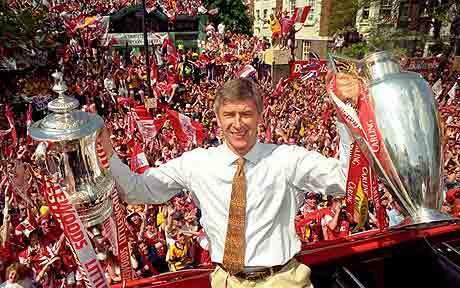 Similarly, the most debated topic between Arsenal fans right now is Arsene Wenger. The neutrals and some of our own look at his last 8 years in charge as a failure, and I’m not going to go on about how we had to build a new stadium, Dein leaving, and blah blah because you probably know that already, but it’s very important to understand that he’s done wonders on a shoestring budget. 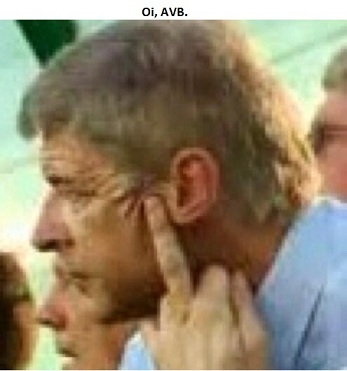 Earlier this season, I was on the fence about my perception of Arsene as well. I thought he might not be the manager he once was, that he was stubborn with his ways, but you have got to give credit where credit is due. He has made such bold decisions this season and has almost singlehandedly secured fourth place for us, in my belief. The turning point for this season was definitely the win in Munich. The fans I follow on twitter were furious when the lineups were announced that Wenger dropped Szczesny and Vermaelen for a must-win game. Our number 1 was then replaced by Fabianksi, who had been sidelined for a long time and had just played one U21 game before that one. He went to have a decent run of games until getting injured vs Norwich again. That gamble paid off heavily. We all know Wojciech is capable of being a world beater, but he, too, has had a major injury this season, and when fit, he hasn’t performed to the best of his abilities. He needed a break and when he made his return, it’s fair to say that he did well. Against Wigan, he made a vitally important save early in the second half when the scores were level. I reckon we might have buckled under the pressure and lost if that had gone in. The other decision was obviously to drop Vermaelen, something I called for many months ago, and I’m glad Arsene took it upon himself to do drop our captain. Per and Kos have been immense. I can go on and on about Koscielny (This chant is currently my ringtone: http://www.youtube.com/watch?v=JZXl17QyyoU) but I’m so glad he’s getting the recognition he deserves. Vermaelen has simply been rubbish all season, and if he does stay, he should be 4th choice when we sign another CB. I will support him every time he puts on Arsenal colours, but we deserve a better captain. One thing that has surprised me towards the end of this season about Arsene are his tactics and substitutions. In the crunch tie at St. James’ Park, Mikel limped off early in the first half and I was thinking we should bring on Vermaelen as a DM; a position which he wasn’t unknown to play during his Ajax days. (Personally, I’d like to see him there a few times if he remains at Arsenal next season. RDM and Benitez tried Luiz out in midfield, almost as a box to box midfielder, and he did fairly well there. The Brazilian and the Belgian have similar strengths and weaknesses; both are very good on the ball, decent dribblers, but also overcommit and misread tackles.) Thomas would have provided the back four with some extra defensive stability and kept Ben Arfa, who kept cutting in all game, at bay. But, Arsene brought on Chamberlain instead. In central midfield. Our best natural winger in central midfield. Chambo has played through the middle before, notably vs Milan at home last season, but he was a bit further up the field. I honestly expected him to get clattered by Tiote, but he showed us some incredible maturity and stood up to the task. The Ox made some decent challenges to break up play, working hand in hand with Ramsey, and also started moves from the back. This substitution changed the course of the game and was the spark we needed for the three points. Also, I have noticed a change in attitude for our tough away fixtures. We look to be more on the defensive, wanting to control the game from the back rather than attack all the time. I’m not sure whether it’s been Wenger or Bould’s work, but either way, we have dug deep and held onto three points many times this season when I half-expected us to drop points. Theo said that Arsene gave the boys Le Hairdryeur at half time vs Wigan, and one other game that comes to mind immediately was the 3-0 win vs Villa at home a few seasons ago, where he had to rely on a crocked Cesc Fabregas to come on and save the day. I remember reading that Cesc had said that AW told them that they “weren’t fit to wear the Arsenal shirts” when it was a stalemate at half time in another must-win game. Throughout the season, I thought Wenger had lost his ability to motivate and give the players a kick up the backside when needed, but I was mistaken. I’m sure having the intimidating figure of Steve Bould next to him scares them more than good ol’ Pat Rice did, but the Frenchman obviously still has it in him to inspire and push the boys. In times like these, I loved being proved wrong. We should stick with this nucleus of players we have got and barring some which need to be shown the door, hopefully strengthen in order to mount a title challenge. The top 3 sides in the country have new bosses, while we now have the longest serving manager in Britain (how good does that sound?) who knows his way around. I find it rather interesting that Wenger refused to comment when asked whether Fergie’s retirement was discussed during the sale of the Dutch c*nt. Could he have one (possibly last) trick up his sleeve? The gaffer has all the ingredients he needs to conjure up something special and bring us back to our glory days. Go on, Arsene. No one deserves it more than you.